I don’t think that special trains at the holidays are a new thing, but using the trains to raise funds for food banks and charities is a more recent innovation. 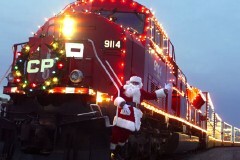 Both Canadian Pacific and Kansas City Southern run holiday trains; there may well be others in the same vein. Canadian Pacific’s train is older (it began in 1999) and better-known (it was featured in the latest issue of Trains, and I even caught a TV documentary about it somewhere). It covers virtually its entire network over nearly three weeks, and features musicians who put on a short concert at each stop. Kansas City Southern’s train (press release for this year’s here or here) makes one stop a day at 4 PM sharp, lacks the musicians but has tours of the train. Regardless of how either railroad does it, they’re making use of the inherent PR power of trains — which most of the time, I think, is seen as getting in the way — to do a little good.